There’s a reason the back of the house is also referred to as the “heart of the house.” To increase sales and improve service in the front of the house, operations must be running smoothly behind the scenes. The Service That Sells! Back of House Training Series is online training for your kitchen staff on facility care and safety specific to back of house operations. With every guest who walks through the door, your staff should be striving to not only meet expectations, but exceed them. 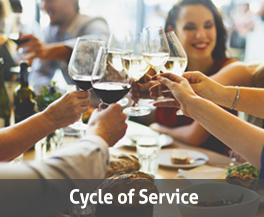 Our Cycle of Service training breaks down a guest’s visit into separate steps and trains staff to deliver exceptional service throughout the dining experience. The restaurant business is show business, and that means that there is a lot happening behind the scenes to support the main attraction. Our operations training for restaurants provides critical training on topics that help keep your restaurant safe and secure.